P.S. Perfect to watch in this weather! Trixie is a law student who isn't aware of the musical genius in her; Gino is a long-time musician itching to make a name for himself. He sweet-talks her into becoming a part of his band and his life, but success comes with a price, and insecurities play a big part in almost ruining their relationship. Sarah Geronimo and Piolo Pascual star in this heartbreaking movie by local cinema's own couple peg, Antoinette Jadaone (That Thing Called Tadhana) and Dan Villegas (English Only, Please). Pitch perfect moment: When Trixie and Gino wrote what would become the band's breakout hit, while melting our hearts with some grade A flirting. Teehee! Norah (Kat Dennings) is the no-nonsense, straight-edge daughter of a big-time music producer; Nick (Michael Cera) is a struggling musician who just got dumped by the love of his life—who happens to be Norah’s nemesis. They meet on one serendipitous night, the kind with enough magic to turn a five-minute fake relationship into one for keeps. Pitch perfect moment: While looking for Norah's missing bestie in a bar, "their song" comes on, resulting in a super cute dorky dance-off capped off by a dance-wich. He's a Broken Hearted Hoover Fixer Sucker Guy; she's a flower seller with a broken vacuum cleaner. They soon start making music so raw and real that it’s no wonder "Falling Slowly" won an Oscar for Best Original Song, and the movie was eventually turned into an award-winning Broadway musical. Pitch perfect moment: When he taught her how to play "Falling Slowly" on a borrowed piano and he played the guitar. "Take this sinking boat and point it home, we've still got tiiime." From the director and writer of Once, John Carney, comes another music-driven love story. 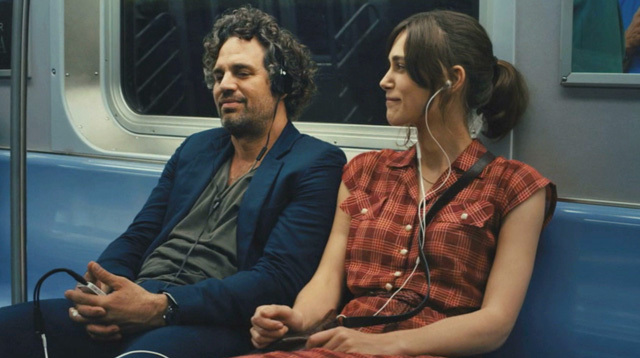 Dan (Mark Ruffalo) is a record label exec struggling to keep up with the times; Gretta (Keira Knightley) is an unassuming singer-songwriter, whom Dan signs to his label on the spot. Pitch perfect moment: When they walked around the city all night and got to know each other on a deeper level by listening to one music player with the use of a headphone splitter. To see more movies about music + feels, check out Candymag.com!